Ready to bamboozle even the most die-hard cynic? You have the supplies, right? 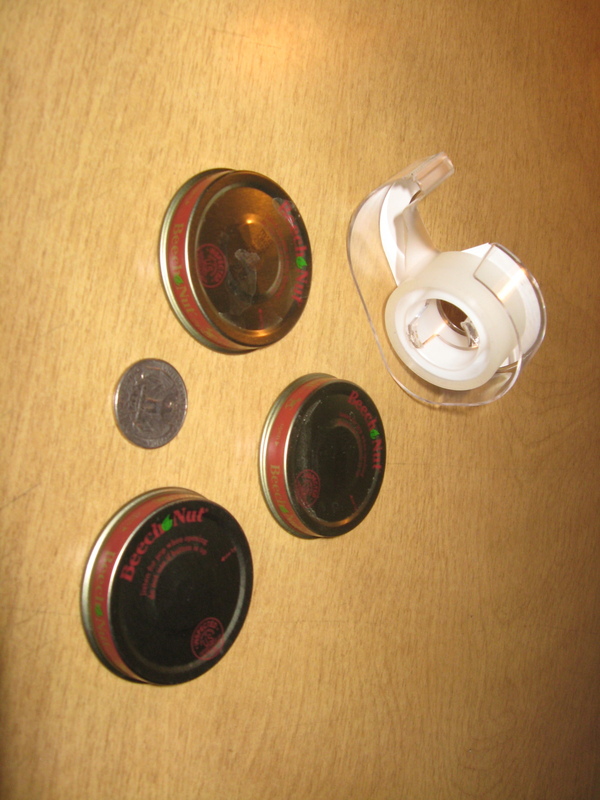 The 3 lids, the quarter, the tape, and your head? Actually, we only need a single hair from your head, not the whole bowling ball. Go head. Grit you teeth and pull out one of the longest hairs you can find. Oh, hush....it doesn't hurt that bad. Here's the sneaky part...where the "magic" of the trick lies. Tape that strand of hair onto the quarter. Shhh. Don't tell anyone. That piece of fuzz is the key to performing this trick. Here's how we'll do it. Gather up some kids. Tell them to prepare to be bamboozled. Explain that you have x-ray vision and see through metal. Ask for a volunteer from the audience to assist you in performing this astounding trick. Lay the quarter, hairy side down, on the table. Okay, listen up now. The next step is very important. Cover the quarter with a lid, being certain that the strand of hair is sticking out from under it. You can see the hair. Your audience will miss it. Tell your assistant that, after your eyes are closed, to gently shift the lids around, altering their placement. Once that is done, open your eyes. Explain that, in order for your magical x-ray vision to be fully effective, you must peer very closely at the lids. Lean in and look for that strand of hair sticking out. Ta Da! You did it. You found the quarter! That's all there is to it! Simple, huh? Now, if only finding the ball under those whirring Jumbo-tron baseball caps could be this easy. Sheesh.